Colombo, Sri Lanka -- With the rapid spread of Buddhism in the western United States, boosted by increased immigration from Asia, Americans should consider applying Buddhist principles to solve their everyday problems. Although Buddhism has two major sects - Theravada and Mahayana - both agree on the crux of Buddhist philosophy based on the Four Noble Truths (FNT), the Noble Eightfold Path (NEP), and the associated 12-factor formula of conditioned genesis (paticca samuppada). Buddhist population worldwide range from 350 million to 1 billion. The 2010 religious census estimated the Buddhist population in the U.S. at 1 million, mostly located in metropolitan areas with population greater than a million. The census found San Jose, California, to be the most Buddhist city in the country with approximately 1.25 percent identifying as a Buddhist adherent. Buddhism, in contrast to the three major Abrahamic religions, is not interested in conversion. Buddha was an enlightened human being who discovered the path to nirvana the state of non-existence. Adherents of all religions can practice Buddhist principles without incurring the wrath of the omniscient God because they have universal universality. The original Pali terms is used in this essay because no single word in English can capture the connotative depth of the terms that Buddha used. Buddha concluded that no sentient being could avoid ongoing dukkha in his/her bhavacakra (wheel of becoming), which rotates from fetus to birth, and then experience jaramarana (sickness, old age, and death) within the ambit of samsara (cyclic existence). 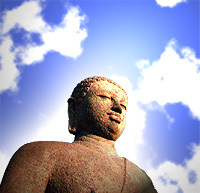 Buddha illustrated the operational dynamics of the first three noble truths in his paticca samuppada formula. The bhavacakra of every sentient being took a circular form because it had no beginning or end. He did not answer questions on the First Cause or expand on the nature of nirvana because they were beyond human comprehension. He gained his insights by purifying his mind and using the techniques of bhavana (meditation) to comprehend the causes and effects of existence. Buddha identified a cluster of 12 mental, biological, and physical nidanas (conditioned factors) that invariably engendered dukkha in the samsara. He surmised that living beings should follow the NEP, also called the Middle Path, to control their tanha (“thirst”/greed/desire/craving), which is interconnected, interdependent, and interactive with all other nidanas. In particular, tanha was reinforced by the impact of the five nidanas surrounding it - phassa (contact), vedana (feeling), upadana (clinging), and bhava (becoming). Bhava identifies a sentient being as a namarupa (name and form)—a composite of panca skanda (five aggregates), where rupa stands for the physical form, and nama for the mental/nonphysical aggregates of feelings (18 types), perceptions (six types), mental formations (50 types), and consciousness (six types). These five interdependent aggregates are in continuous flux (anicca). Because every existing thing, both mental and physical, is anicca, the presumption of a permanent soul (atta) is inaccurate. The reality of existence is asoulity or no self (anatta). Thus, no person is the same except for the duration of the present moment, and the addiction to think in terms of the first person singular (I, me, my, mine) will merely prolong an organism’s dukkha in samsara. The three marks of existence, Buddha said, are anicca, anatta, and dukkha. Descartes’ assertion Cogito ergo sum (“I think, therefore I am”) led to the belief that mind and body were two independent static nidanas. But Buddha had correctly seen more than 2100 years earlier that at one’s death the panca skanda discarded its rupa component while the four nama components remained intact in a state of flux until the cluster entered a new rupa in samsara (cyclic existence) depending on its karma (volitional actions). This is what is called punarbhava (rebirth or re-becoming). It is different from Hinduism’s re-incarnation. Before rushing into committing any physical or mental action (karma), meditate on its short-and long-term consequences on every sentient being in your environment, including your adversaries. You can reduce your dukkha by realizing your asoulity (anatta) and impermanence (anicca). Train yourself to control the three roots of evil: greed and desire; ignorance or delusion; hatred and destructive urges, which are embedded in your five aggregates (panca skanda). Use systems thinking, applying the principle that all elements in the system are interdependent, interconnected, and interactive. Follow the middle path to tone down excessive emphasis on individualism, which breeds selfishness, self-righteousness, egotism, arrogance, etc. The second amendment to the U.S. Constitution cannot pass muster under Buddhist principles. Buddhism does not endorse weapons for individual protection or use of guns for pleasure hunting. Gunaratne is professor of mass communication emeritus at MSUM. He is the author of an autobiographic trilogy. He conducts a Buddhist discussion group in Moorhead once a month on the second Saturday evening.